Lock in a great price for Starfish Bungalows – rated 8 by recent guests! Well isolated offering you a very peaceful stay with the feeling of being in the middle of a jungle. The path to the bungalows is well lit up to be covered in night. Don't miss the sunrise from this location. Starfish is ideally located between Long Set and White Beaches, nestled in amongst the jungle trees just back from the oceans edge. Its well designed layout gives you a peaceful, private and open to the sea aspect to take in the sea breezes and views through the trees from your private balconies. The bungalows are very clean and well serviced. While it doesn't have its own resturant or bar the Treehouse , with its amazing bar and restaurant, is a short stroll next door. I was impressed with the hospitality of all the staff of the property. Spacious bungalows, mosquito net, nice terrace with a hammock. 5 min walk through the jungle to the beach (4k beach). The beach itself was beautiful but still not without trash. Our stay at Starfish Bungalow was what we expected for an island with developing tourist infrastructure. The location is a perfect mix of close to restaurants and nightlife (15 min walk) and more deserted, quieter beaches (15-20 min walk). Our room was cleaned every day and offering breakfast at the property was a plus. There is a hammock and chairs at each bungalow where it was beautiful and relaxing to hang out! We've had a very nice stay here. Everything was what we expected for the price we paid. The staff was very friendly! And they arranged a pick up service from the main pier when we arrived, which was really nice. It is in a good location in between 4K beach, where the nice bar NEST is located, and the village which can get noisy at night with all the bars and pub crawls, so it's perfect if you like to relax. We walked at least 1 time a day to the village which was only a 10min walk. Sometimes even more so it's not too far at all. The breakfast was okay. Not the biggest portion but just enough. I would recommend to stay here! Starfish Bungalows This rating is a reflection of how the property compares to the industry standard when it comes to price, facilities and services available. It's based on a self-evaluation by the property. Use this rating to help choose your stay! 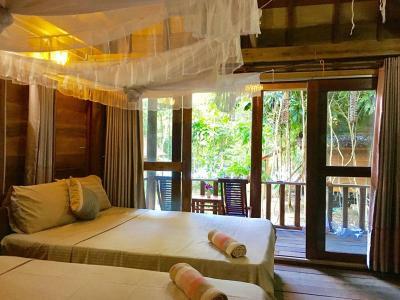 Starfish Bungalows is a 2-star property located in Koh Rong Island, facing the beach. Around a 13-minute walk from Koh Rong Dive Center, the property is also 0.8 miles away from High Point Adventure Park and offers free WiFi. The hotel provides an Asian restaurant. At the hotel, every room comes with a desk. Starfish Bungalows has certain rooms that feature a terrace, and rooms have a private bathroom with a shower and free toiletries. At the accommodation all rooms include a seating area. Sok San Port is 8 miles from Starfish Bungalows. 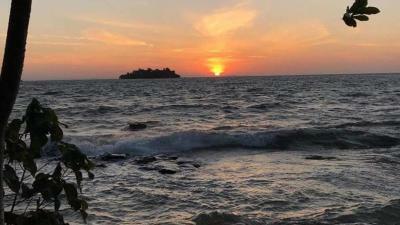 Sihanoukville International Airport is 14 miles from the property. When would you like to stay at Starfish Bungalows? This twin room features a private entrance, dining area and seating area. House Rules Starfish Bungalows takes special requests – add in the next step! No crowded place. Enough room in the bungalow, we had one of the closest to the reception, those are the best. The location was beautiful. Quite and calm yet walking distance from the main village. The host was very helpful and the food was excellent. I would definitely recommend it. We tried to stay away from the noise from the village. Turned out that there were some sort of a party place at the 4k beach and you could hear the music from there. Luckily there weren't parties every night. The bungalow was awesome. Nice and relaxed place in easy walking distance from the village and 4k beach. Would stay here again! The staff is super nice and helpful! Bungalows are big and clean and the beds were so comfortable. 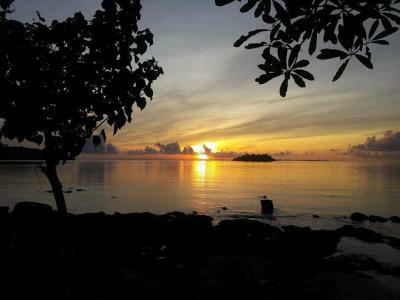 The location is perfect; in the jungle between two beaches and not long walk to the village. We loved this! Great location, right in the jungle but near to the sea. The bungalows were clean, the view was outstanding. The Starfish offers a taxi boat from island pier to the property, but it’s not a Starfish boat, it’s independent. I’ve used it when I left. The staff was very helpful and friendly and the manager ms. Ngeth Sothary is a great person. It was really a pleasure for me to know her. Having a vegan diet (due to health issues), she helped me to respect my diet by cooking for me dishes according to my health needs. She made me enjoy the local vegan food, with good ingredients. The dishes were very tasty and well priced. She made my stay very pleasant and, thanks to her, I loved my stay. I highly recommand this location to all visitors. I've promised myself that I will come back, together with my family, for more days, in a vacation. PS. I don’t understand why people are complaining about WiFi. If you read properly the hotel policies you can see the rules, the WiFi is free in the common areas. By the way, we go there to relax and enjoy the view, not to spend our time on the WiFi, in my opinion. Thank you for your hospitality. Really good place, I’m pleased I chose it. The bungalows are lovely and well distanced from each other so they feel private. The family who own the business were all very nice, friendly and helpful. It’s in a great, quiet location in between two beaches, easily reached on foot. 5/5 rating. Really nothing, everything was great! Great place to relax! Amazing living in the nature, you can see gekons and monkeys. Sathory - the accommodation manager is really very pleasant person, ready to help and advise whenever we needed. Rooms are clean and far from noisy places around the sand beaches. Amazing snorkeling in front of the Starfish bungalows (better then sand beach). If we needed swimming, the white sand beach is very close, 3-4 min walking. There is no beach overlooking this property. Calm and serene. Helpful and English proficient staff. Short walk away from good beaches. Friendly and helpful staff. Beautiful view of the water while eating breakfast. Away from the village so get a good night sleep but not too far to walk too at the same time. Peaceful and relaxing accommodation. The location was a little far from the main town, and it was also set back from the beach. Extremely difficult to get to Starfish. Know that it's a two-three hour boat ride from Sihanoukville pier to island (30 min $20 taxi ride from Sihanoukville airport to pier.) Take car vs tuktuk whenever possible in Silanoukville as the entire area is under construction and dusty, "roads" so rough and horrible that travel is exasperating. Starfish offers a water taxi from island pier to their property, but it's not Starfish boat; it's independent and not reliable. Not running day of arrival. If you back pack, you can just walk. All resorts run into each other, so go right off pier you'll pass through 3-5 before Starfish. They all more or less connect. We had heavy luggage so got a ride with Treehouse resort next to Starfish. We had to arrange. Starfish good about communication before trip, but not really helpful in actuality. We had to leave a day early due to HUGE amount of time required to get back to mainland in order to get back to airport, but were charged for two nights. Lady at front desk not friendly, polite or helpful. Repeatedly said things not her fault. Male workers seemed nice, smiled, but don't speak English. Day of departure lady told us taxi would get us at 3:00 PM but we would have to carry all luggage to next resort beach as Starfish cove too rocky, but then taxi not working again, then it was, but we felt we were being jacked around by this time. We again arranged our own transportation with Treehouse resort, which has great restraunt/bar and helpful staff. I liked Starfish, but their front desk person needs some customer service training. Be prepared to arrange your own transportation to resort...or just stay at Treehouse. (Their bungalows older, but new ones in progress.) Also, beware of monkeys. They travel in groups and are aggressive. Six on our deck; one jumped down and attacked me. We were not feeding them or teasing them, just trying to make our way into bungalow. Bungalow very nice and property has lighted cement pathways. Beach short walk away on adjacent property where there's ample room to hang out if you purchase food/drink there. Starfish has a rocky coast, but still nice to hang out on comfy beach chairs and hammocks. Spent lovely morning At Starfish listening to waves crash on shore. Really great property! shower is ice cold, no breakfast options for 2 days, wi-fi is useless, beach in front is rocky and absolutely not for swimming, trash everywhere. staff and the owner are unprofessional, inconsiderate and straight up rude. customer service here is non existent. you can find better, cheaper and much friendlier options elsewhere on koh rong. Hot water would have been nice. The location was perfect. So quiet but within easy walking distance of nightlife. It had its own little secluded beach with sunbeds. The room was well presented and spotless with lots of storage space. Having to leave after 14 days. We absolutely loved it.